It’s so glaringly obvious that it’s surprising how often we overlook the fact that we literally owe our lives to our parents, whether those lives are good or bad. Quite apart from the genetic material that became fused and handed down to us in a miraculous instant of biology, are the formative years from birth to early adulthood: where we lived; who we had around us; how our parents treated us; what education and healthcare we received; and whatever preparation and contacts they helped us form as we made our first tentative steps towards independence. As I said, this stuff is so obvious we forget it pretty much every day after we fly the nest, assuming of course we hadn’t already lost sight of it. A couple of things have helped change that forgetfulness for me in recent years, the first of those was becoming a parent myself. Through the amazing highs and lows of the sometimes terrifying parental roller-coaster you realise exactly how much hard work and sacrifice your parents had to go through to bring you up. Suddenly all of your flaws and mistakes, however well intentioned, affect another life that for the next few years is utterly dependant on you. It’s humbling, and if it doesn’t extinguish the last embers of the ungrateful child in you then you’re missing something. The second big change was when my dad died a couple of years back. I’ve heard it said that losing your parents is one of life’s rights of passage, and I can say for me that was all too painfully true. In amongst the grief, something so odd happened to me at the funeral that it’s a struggle for me to put it down in words. During the moving eulogy it was mentioned how much Dad loved to go to the beach with my sister and I – another thing which I had forgotten down the years. A little later as we went to drink a toast at Dad’s wake the bizarre event occurred. I pulled out my phone and the background wallpaper had changed to a photo taken of our son Ben a couple of weeks before – at the beach. There he was sitting in the sand beside his ball, looking back at me. I’m sure I had been fiddling with the phone in my pocket during the service, because I am an obsessive fiddler. But to get all the way through the menus, select that one picture and then set it as the wallpaper took so many clicks on my old phone I could barely manage it even when I was holding it in front of me. To have it happen blind in my pocket based on random fiddling seems incredible. Despite being a normally rational person, it feels like some remaining spirit of Dad guided those fingers with a purpose – to send me a message that he had shown me everything I needed to be a good dad myself, and all I needed was to follow his examples. Get out there, play, go to the beach. I’m willing to bet that as Bradley Wiggins crossed the line in the yellow jersey this year, he thanked his dad, probably both his parents, for helping him to become the first ever Brit to win the Tour de France. I can’t pretend Dad had anything like that influence on my late developing interest in cycling, but there are some cycling related things I remember clearly from my childhood. One of these was that both my parents believed bikes were not gifts for birthdays or Christmas – but represented transport and independence for us as growing kids. As a result, we always had a bike that fitted and worked, and it got replaced when it became too small or worn out. The first bike I recall properly was my first “big bike” – it was a bright gold and red, and I think it was a Raleigh. I forget if it had gears, I have a vague memory of a three speed Sturmey Archer with a twist grip change, but maybe that was one of my friends’ bikes. I fell off it the first day I rode it, but after that shaky start it became much loved and abused. Funnily enough, in later life I fell off each of my motorcycles exactly once too – and they also became much loved. The last bike they bought for me was a blue and red Dawes, with front and rear dérailleurs with old school, non indexed shifters either side of the down tube. I think it was a 10 speed, even though that seems ridiculously few compared to modern machines. That bike lived up to my folk’s belief in bikes as transport, and got ridden to and from my secondary school many times in good and bad weather. Another cycling influence which came from Dad is stories he told to me of his own adventures as he was growing up. These have taken on a greater significance to me in the last couple of years since his passing, and as the time I have spent cycling has increased. I wish I’d listened more carefully to him telling them to me as a child, although I guess what I really wish for is that he were still here to re-tell it to me. I’m fortunate though, Mick Milward was one of Dad’s gang of friends, and he has kindly shared with me his recollections of one their greatest cycling adventure to add some meat to the bones of my own sketchy memories of Dad’s tales. At this point I’ll let Mick’s words take up the story …. I have written out the cycle trip for my own ‘history’ which I keep saying I will write. So it is a bit longer than I thought it might be. I have added a map, which is a modern one with motorways – they didn’t exist then in 1948. In the description in my diary there was a name against each day – maybe we took in turns to be the leader, but I don’t really know. 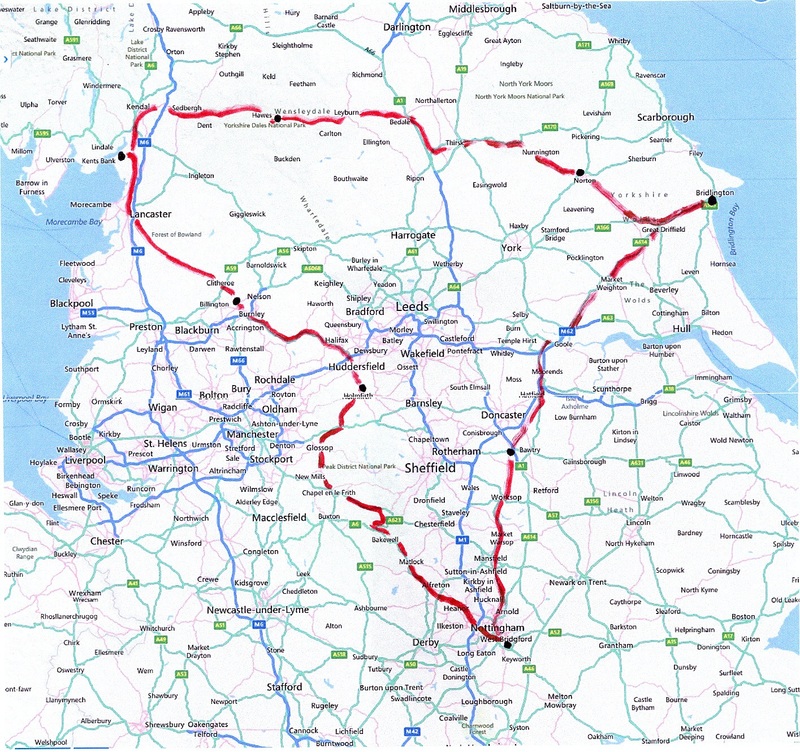 The route would have been through the Peak District. I remember that when we arrived at Holmfirth town we then had to ride (or push) 2½ miles up a steep hill to the hostel. I described the hostel as ‘indifferent’. This must have been through places like Hebden Bridge, Todmorden, and Burnley to reach this small village in the shadow of Pendle Hill. 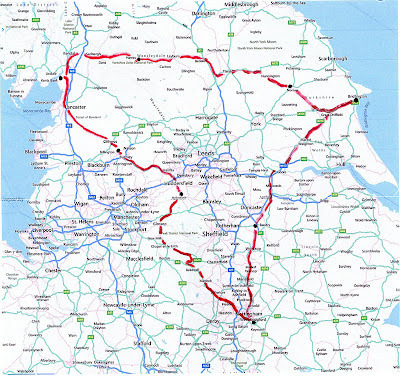 The obvious route would have taken us over the Trough of Bowland and then up the coast into Cumbria (Cumberland). Day of rest, looking at the sea, maybe a bit of train spotting. Route via Kendal, Sedburgh and Hawes with quite a few hills through the Yorkshire Dales. I seem to remember going to a film show in the village hall in the evening. A fairly level ride through Wensleydale, then via Masham, Thirsk, pushing bikes up Sutton Bank and on to Malton. ‘Indifferent hostel’ – but I made a note in the diary – ‘Beware Warden’s wife’ – these were the days of doing jobs at hostels – she was probably a dragon in her kitchen! A short journey across the Wolds. At this point Derek went to stay with his Aunt. Geoff and I continued our trip down main roads via Goole (no Humber Bridge then), and Thorne to the village of Tickhill, near Bawtry. This journey was memorable only for a strong head wind which absolutely exhausted us. Presumably the wind had eased off a bit as we travelled down the A60 through Nottingham and back over Trent Bridge to West Bridgford and home. You have to remember the date when Dad and his gang undertook their ride. 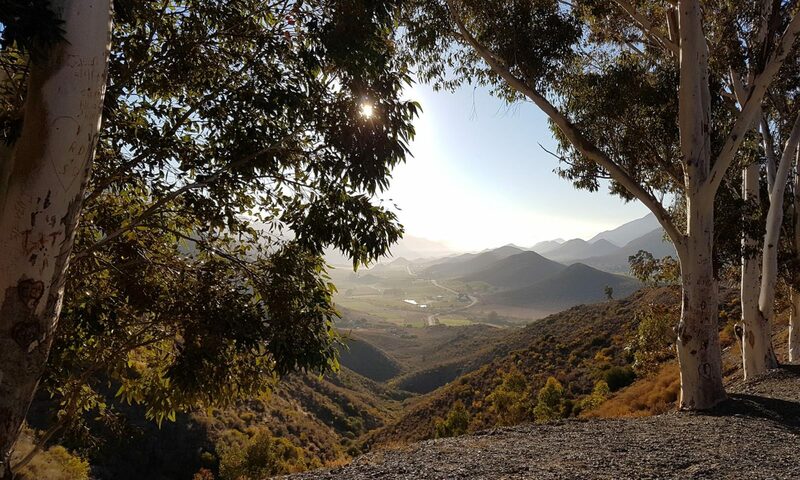 Forget busy roads filled with too many noisy cars and smelly trucks, and imagine a quieter more rural age, with quiet empty lanes, and with cars being outnumbered by trains, horses and agricultural vehicles. As Mick points out, the M1, the world’s first motorway, hadn’t even been built yet. Even on today’s busy and sometimes smelly roads, my heart soars when flying along on a beautiful day in, and I have some sense of how much freedom they felt from riding on emptier and quieter roads in my own childhood. The part that remains vague, despite Mick’s detailed account is exactly where and when Dad did his 100 mile ride – his One Tonner. This was the part of his story which which had me most in awe as a child, wondering how anyone could possibly ride that far. It was pretty close to exactly 100 miles from Dad’s parent’s house in West Bridgford, a suburb of Nottingham, to his Aunt in Bridlington and I am quite sure this was where he rode. But I’m also sure the ride can’t have been on the way back from the 1948 youth hostelling trip after they parted ways in Bridlington. The reason being that I do remember him telling me he tried to ride back to Nottingham from his Aunt’s once but it was so windy around the Humber, he turned back and got the train home. So I think it most likely that his One Tonner was a ride to Bridlington, and therefore took place on a different occasion. Many thoughts pass through my mind during the moments of peaceful contemplation when out cycling, and Dad and his cycling stories are often among them. They’ve just announced that the date of the PPA One Tonner for this year will be 14th October. It’s a ride I have wanted to do for a number of years, and if fitness prevails, I’ll be joining my DC Team on it as part of our training. Even though we’ll be working as a group, probably at a pace above which I’m completely comfortable I’m sure thoughts of Dad’s One Tonner will be with me along the way. I also hope that one day, something of what I do or a story I tell serves as such a fond and enduring memory to our own son.